Evoking the primitive furniture of mankind’s cave-dwelling days, these tables, chairs, stools and desks feel massive and monolithic, yet many are surprisingly lightweight. Some are hewn from heavy boulders, some carved from soft volcanic rock, and others made of materials like wool, wood and concrete. 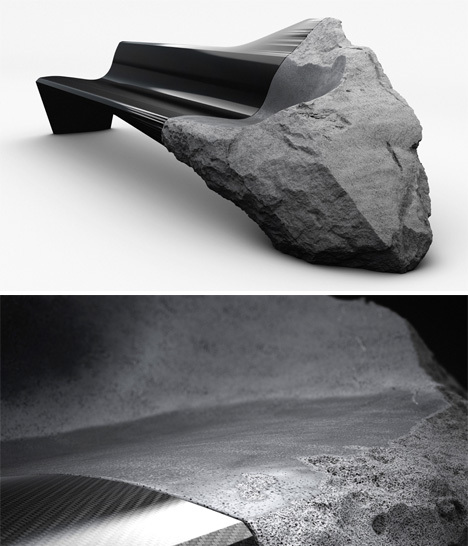 This hybrid sofa is part raw volcanic lava, part ultra-sleek carbon fiber. 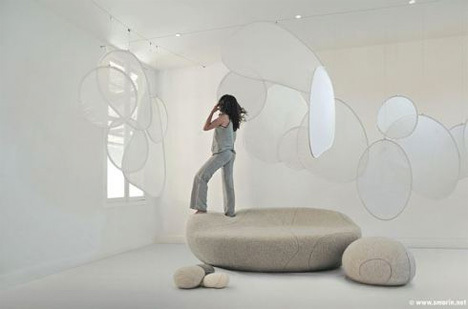 The ONYX sofa by Peugeot Design Lab in collaboration with designer Pierre Gimbergues features lava sourced form ‘the Auvergne,’ a landmark dating back almost 11,000 y ears. The aesthetics echo the bodywork of the Peugeot ONYX supercar, while the material choice is meant to invoke the ‘robustness’ of the car brand’s history. 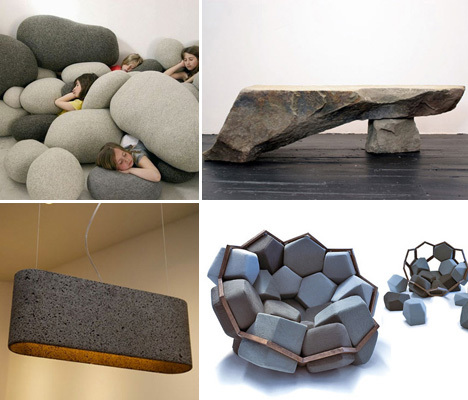 They may look like enormous river rocks, but these ‘Living Stones‘ are actually soft and comfortable poufs made of wool. 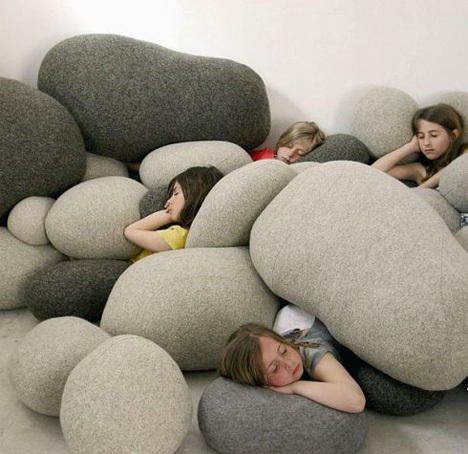 The oversized pebbles come in various shapes and sizes suitable as floor pillows, loungers and footstools. 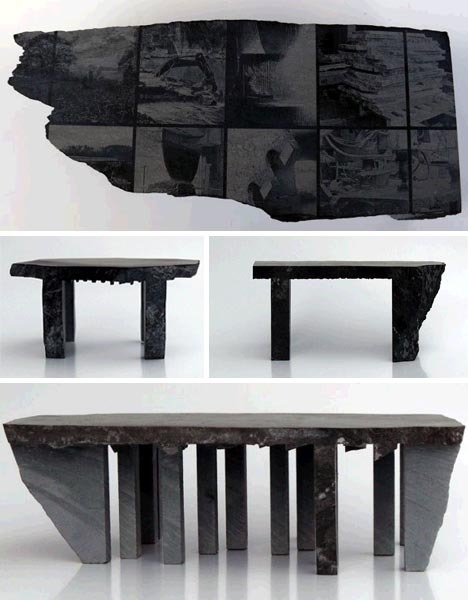 A ragged, rocky edge lends a sense of gravity to this natural stone table by Lex Pott. The variation from the raw natural finish to the smoothed-out table legs on the other side tells the story of the Belgian bluestone table’s creation, from the rock quarry to the final polishing of the finished product. 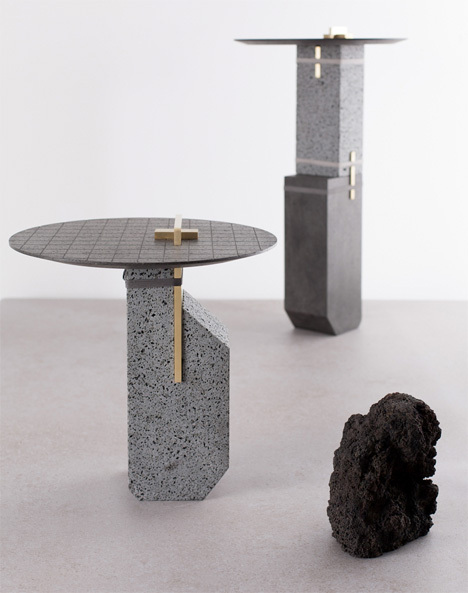 An unusual series of sculptural tables consists of volcanic volumes held together by brass pegs and straps, visually and symbolically invoking Mt. Etna and the cultural history of its surroundings. ‘De Natura Fossilium‘ aims to “bring both the landscape and the forces of nature together as facilities for production,” actively using the lava from the volcano in various manipulated forms. Handmade from natural stone, this pendant lamp seems to defy gravity, dangling from the ceiling with just two thin wires. 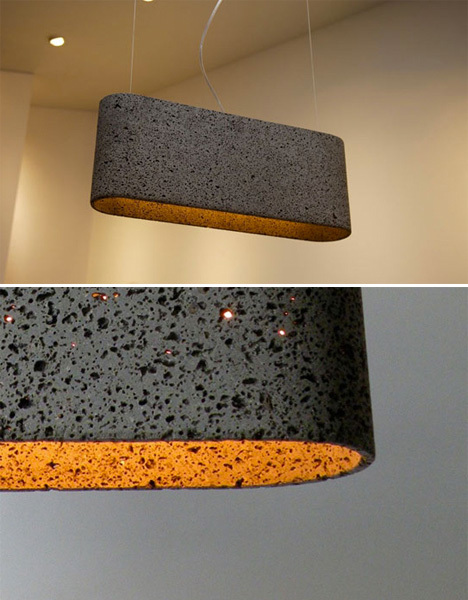 In fact, the Aso San lamp by German designer Daniel Stoller is made of basalt lava and much lighter in weight than it looks.